Celebrate the Opening of Roosevelt! Andres, Atom and other local Greenways leaders prepare to do small business outreach along Roosevelt in 2013. 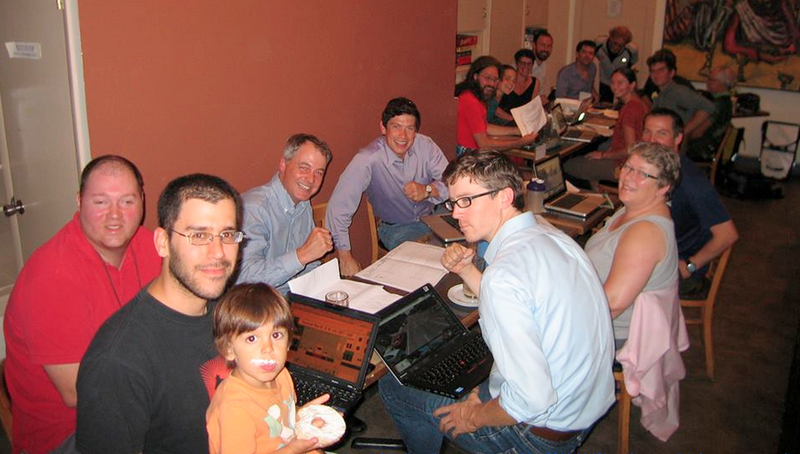 Side note, two other Greenways leaders pictured here are now fathers — Orion and Alma’s dads also want safer, healthier streets for their new babies. 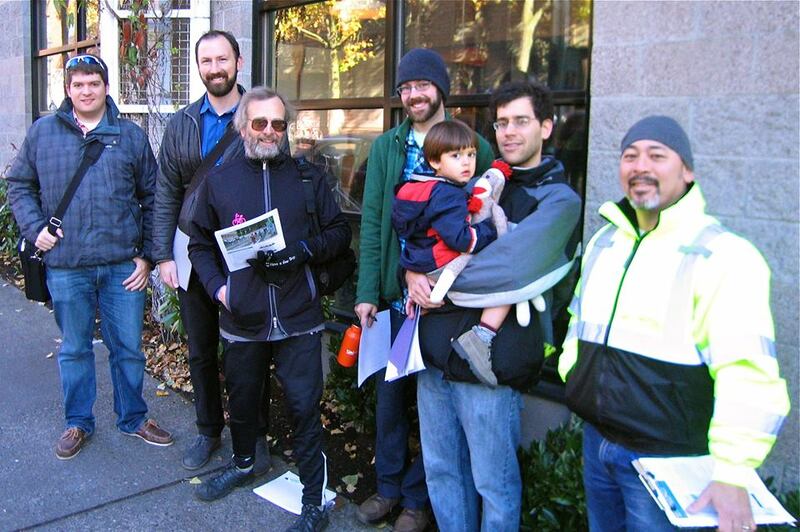 Atom, the little tyke in the photo, was not quite two years old in 2013 when his dad, Andres, got together with a group of other safe streets advocates from NE Seattle Greenways and University Greenways to run a campaign to turn the Roosevelt Way NE repaving project into the Roosevelt Way NE repaving and Protected Bike Lane project. The group pictured here, plus a few others, went out and talked to small businesses about the business benefits of having slower traffic, safer places for people to bike and walk, and great public spaces in the Roosevelt neighborhood. Thanks to their focused local campaign, and the local business support it generated, Seattle Department of Transportation (SDOT) decided late in 2014 to turn Roosevelt into one of Seattle’s premiere Complete Streets. Fast forward three years. Atom is five and the Roosevelt Way NE Protected Bike Lane will officially open, this Saturday, November 5 2016. 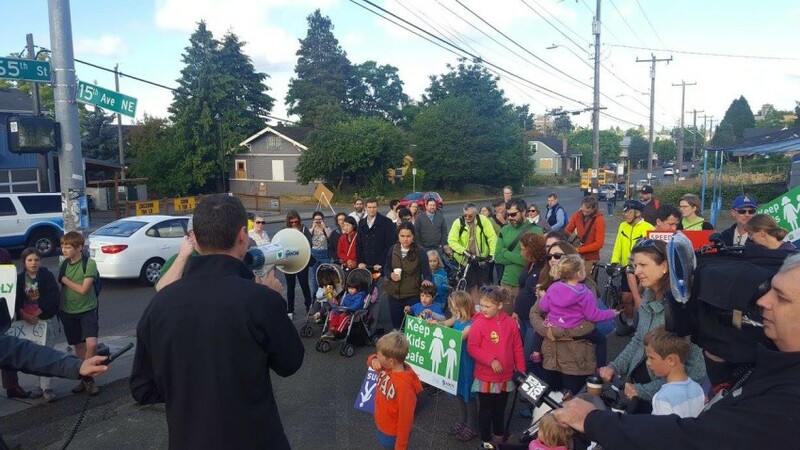 Kidical Mass riders will wield the scissors at a grand ribbon-cutting event with SDOT around noon at the University Food Bank 5017 Roosevelt Way NE. Meet Andres, Max, Scott, Bob, Orion, Forrest, Drew, Alma, Madi, Rjider, Brandt, Barbara, Hank, and many more of the people who made this project possible for this generation and for future generations. Otherwise, join the fun ribbon-cutting at University Food Bank 5017 Roosevelt Way NE at noon! It was. I just sat in the roadway for a few minutes, stunned, bleeding all over myself. I live in Seattle’s University District because I go to school at the University of Washington – I’m in the final year of a Ph.D. program in environmental policy. I’ve always believed in making the world a better place. Bicycling is a part of that, and it’s almost always how I get around. On this particular night I was on my way to see the premiere of a play in Capitol Hill’s Annex Theatre. Congratulations to Mayor Ed Murray, Seattle Department of Transportation Director Scott Kubly, Seattle City Council Transportation Committee members Tom Rasmussen (Chair), Jean Godden, and Mike O’Brien for their bold leadership and vision that will soon make Roosevelt Way NE safer for everyone. You can thank them all on this letter! 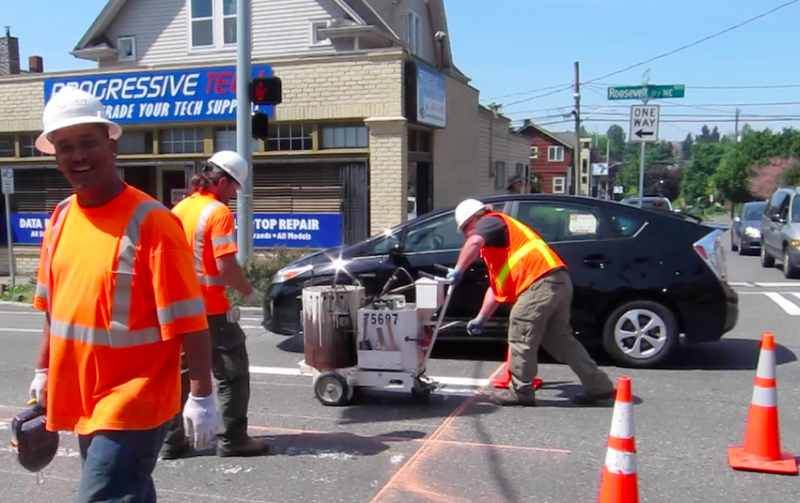 Every year the Seattle Department of Transportation (SDOT) takes on the necessary task of keeping our busy streets in good repair by repaving and restriping them. In 2013, for example, SDOT completed a technically excellent job of repaving and updating two miles of N/NW 85th St. from Greenwood to I-5 through a dense residential and commercial corridor at a cost of about $12 million. N/NW 85th St. now moves car and bus traffic more efficiently and we’ve protected the roadway of a heavily used corridor by doing needed maintenance. The newly formed Licton Springs/Haller Lake Greenways group, that recently received a prestigious National Parks Service Rivers Trails & Conservation Assistance Award, takes issue with how tax dollars were spent on N/NW 85th, which remains a fast-moving, vehicle-centric corridor that is difficult for people walking and biking to navigate. With a large new school opening soon [Wilson Pacific] and North Seattle College, what we need is to create safer crossings, including at least one additional signaled crossing (with turning movements restricted) in conjunction with a new greenway that extends from the schools, across 85th and to the south. SDOT didn’t do just a paving overlay, in most places they removed the old paving down to the base course and in many places took it down much further and put in a new base course, sometimes clear to subgrade. They did utility drainage, sewer & water system work, put in new curbs, replaced asphalt with new concrete panels in many high-weight bus areas and the road was closed in sections for many months. Incidentally, the project was not just an SDOT project, and significant costs also appear in Seattle Public Utilities & City Light budgets in addition to the SDOT budget. Which brings us back to the Roosevelt Way NE Arterial Repaving Project slated for 2015. Thanks to the focused advocacy work and petition from University Greenways, what would have been simply another generic repaving project now includes safety improvements for people who walk and bike. The great news is that a new temporary protected bike lane will be installed in December or January “to make the area safer and more predictable for all road users” between NE 45th and NE 40th streets. 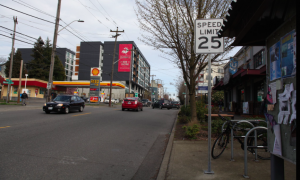 The bad news is that these safety improvements are not funded to continue past NE 45th. While Roosevelt is currently a highly used street for walking and biking (even with bike lanes in the door zone), walking and biking and crossing the street will grow exponentially in this corridor with the current boom in residential construction and the Light Rail Stations opening on 45th and 65th in 2021. Rather than retrofitting Roosevelt Way NE for this additional walking and biking traffic, let’s use this repaving project to complete the street now. Petition Update: The city has agreed to make significant changes to the Roosevelt repaving plan. The University District is the second largest business district in Seattle, and with the University of Washington, Seattle Children’s facilities, and other major entities located there, it’s already a complex area for pedestrians, bikers, and buses. A new light rail station at NE 43rd Street and Brooklyn Ave NE is scheduled for 2021, and plans for mobility and access aren’t coming along fast enough. For the past nine months, residents and representatives of several organizations in the University District have been meeting to discuss the need for a coordinated plan for light rail station access at the forthcoming U District Station. Together, members of the U District Greenways neighborhood group, U District Advocates, U District Partnership, as well as transportation staff from Seattle Children’s and the University of Washington formed a neighborhood-based coalition: the U District Mobility Group. As a first joint action, the Mobility Group hosted a station access walking tour on September 7th — with hopes of building a unified vision for multi-modal access to the new station and the surrounding areas. 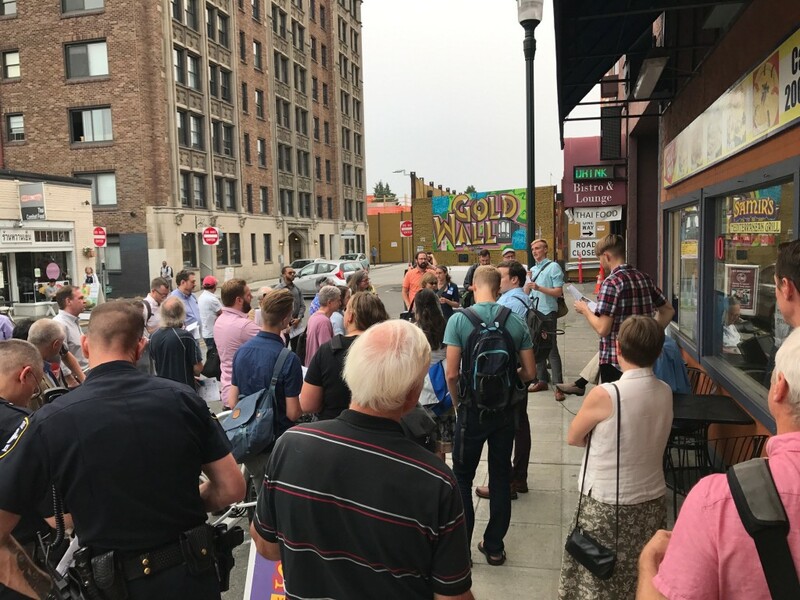 The well-attended (65+ participants) Station Mobility Tour began at the UW Tower and led participants through the neighborhood, on foot, with stops and speakers at several locations. At each location, members of the working group shared insights about the anticipated challenges for accessing the station by foot, bike and bus — and presented a variety of mobility solutions. Most people walk or take transit to the U District and UW — yet pedestrian amenities and public open space are lacking. Many pedestrians and bicyclists do not feel safe near major arterials. Transit suffers from speed & reliability issues and cumbersome transfers. Automobile traffic is concentrated on NE 45th Street, 15th Avenue NE, and the intersection at Roosevelt Way NE & 11th Avenue NE. When the U District Station opens in 2021 it’s expected to serve 24,000 daily riders. That’s a daily influx/outflux of pedestrians and bicyclists in a neighborhood where walking is already the most common form of travel. At the University of Washington alone, 76% of students and employees take transit, walk, or ride bikes. The new light rail station is one among several major changes slated for the neighborhood. With recent upzoning and other development impacts, the U District faces unprecedented commercial, academic and residential growth. The City and Sound Transit are both planning major capital investments in the U District, and Metro is expected to restructure area bus service. Members of the U District Mobility Group want to ensure that as the neighborhood redevelops there’s a coordinated, holistic vision in place for how people will move about safely, comfortably, and efficiently. So far, the U District Mobility Working Group has $87,000 in funding pledged and/or received from Seattle Children’s, U District Partnership, the University of Washington, Sound Transit, Seattle Department of Transportation and the Seattle Department of Neighborhoods. This total includes a $42,000 award from the Neighborhood Matching Fund Program. Interested in updates on the U District light rail station mobility project? Sign up here. Interested in getting involved in a wide range of U District mobility projects? Join the U District Greenways group here. If you value our work, please donate to keep us going. 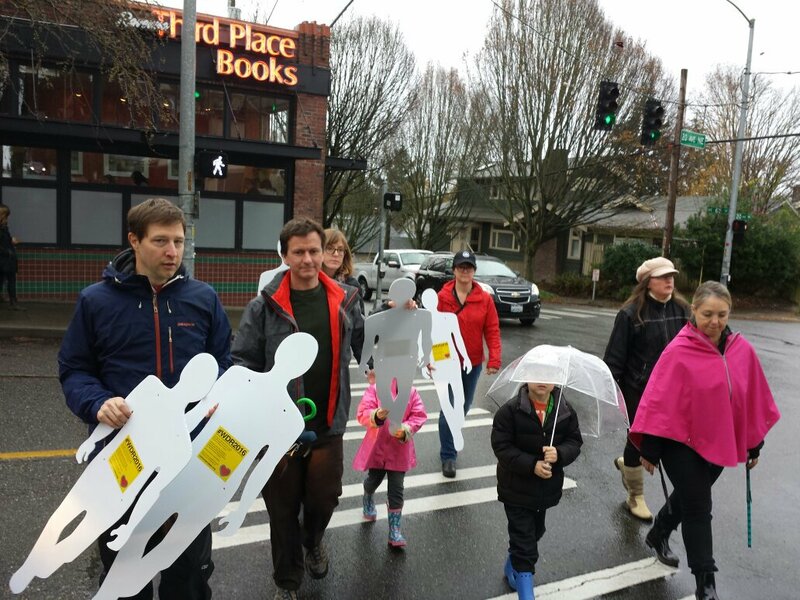 Ready for Safe Routes to Sound Transit? What do the new Sound Transit Link light rail stations opening in 2021 in Northgate, Roosevelt, and Brooklyn have in common? All three have active coalitions of local groups dedicated to getting safe routes for people who want to walk or bike to transit. The University/Brooklyn station mobility group includes NE Seattle Greenways, University Greenways, U-District Square, the U-District Partnership, the University of Washington, and Seattle Children’s Hospital. 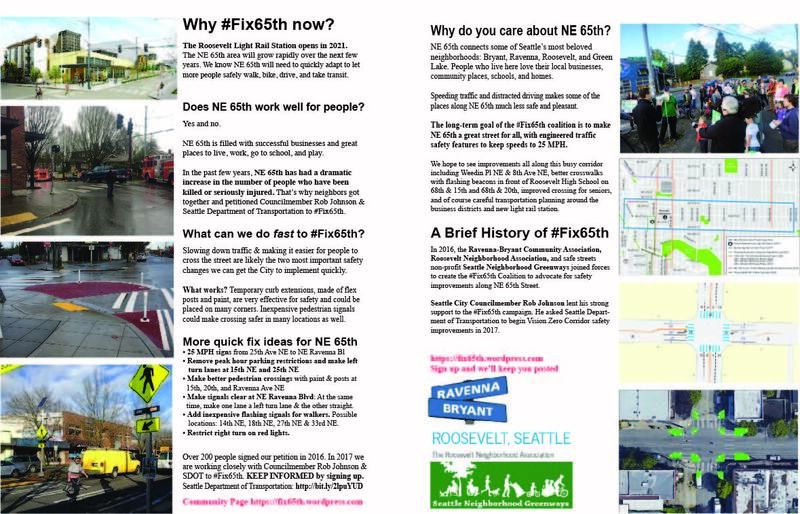 Further north, NE Seattle Greenways brought together the Roosevelt Neighborhood Association, and the Ravenna Bryant Community Association in the #Fix65th Coalition to calm traffic along the dangerous NE 65th Street corridor leading to Roosevelt Station. Seattle Department of Transportation (SDOT) is planning safety improvements along NE 65th in 2018. 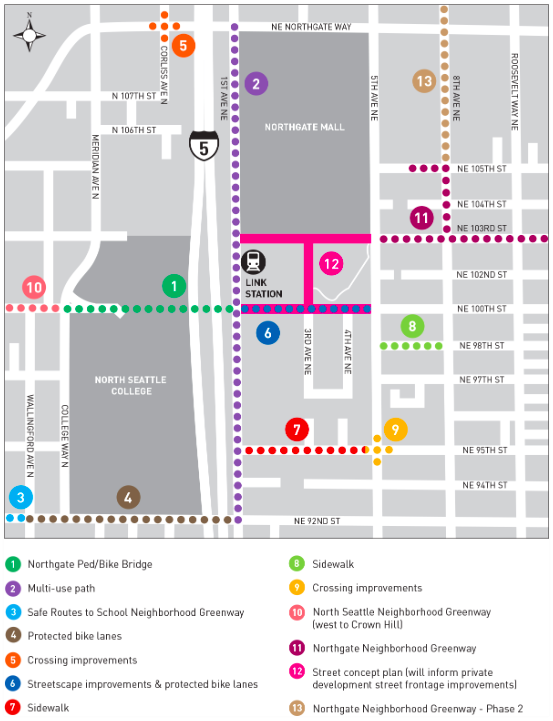 Multiple SNGreenways and other groups are engaged in getting people safely to the Northgate Station. Through August 24, you can answer an SDOT on-line survey about station access. All of these community coalitions are meeting with SDOT, Metro, Sound Transit and other agencies to make sure access for people who walk and bike is front and center at the new Sound Transit stations. Seattle Council Member Rob Johnson has been a strong ally for all of these coalitions. As their August 9 public meeting, Seattle Pedestrian Advisory Board will tour the three new Link stations. A separate community tour of the University/Brooklyn Station is planned soon. Stay tuned and get involved!